Sunday, August 30th, Summer of Soul Art Exhibition Opens at the Upper West Restuarant! 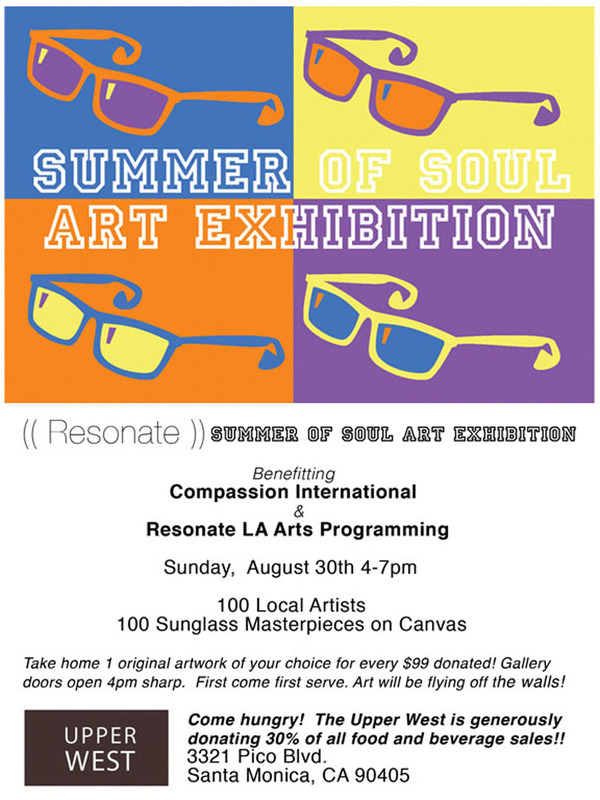 On Sunday, August 30th, the Upper West Restaurant hosts the Summer of Soul Art Exhibition, which will benefit Resonate LA Art Outreach and Compassion International. It’s a great way to give back while indulging in the fantastic cuisine of this popular restaurant. Upper West is known for giving back and has held numerous benefit events for important causes. The three-month event entitled “Summer of Soul” included Soul Music, Soul Food, Soul Mates and Soul Revolution. 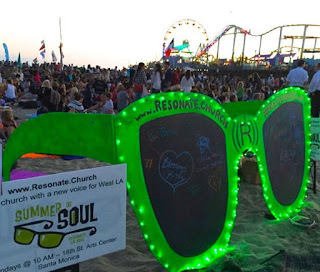 Neon green sunglasses have become the icon of this summer in Santa Monica. 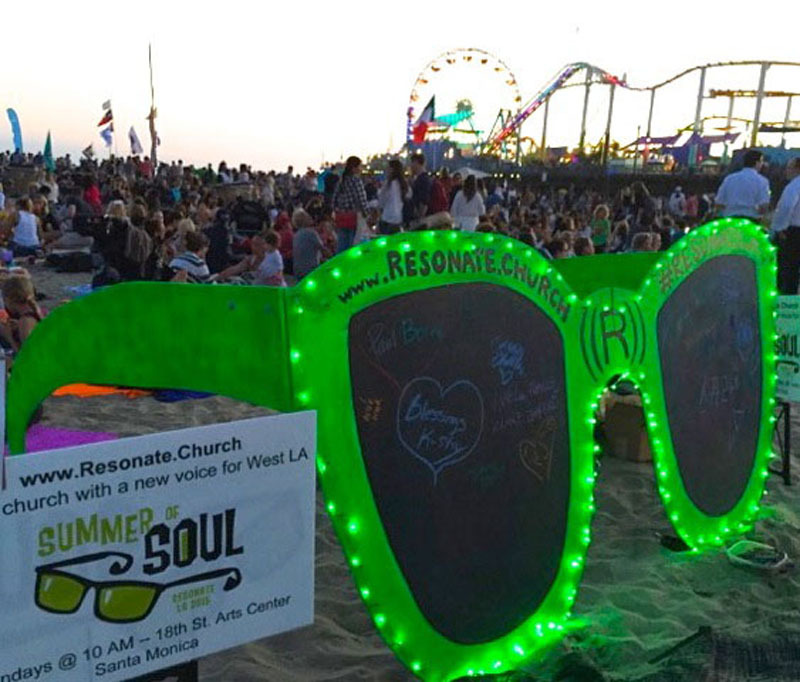 They are not only Resonate LA’s logo for Summer of Soul, but also an 8 by 8 foot interactive sculpture that appears weekly at Santa Monica’s Twilight Pier Concerts. Residents and visitors leave their mark on the oversized chalkboard lenses, take photos with the sunglasses and often use them as a landmark to meet up with friends. 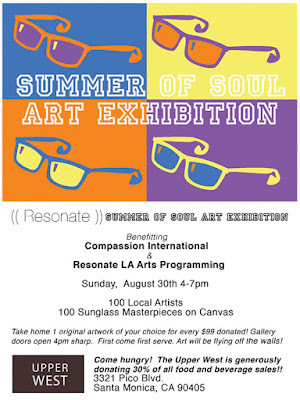 Summer of Soul Art Exhibition is the culmination of Resonate LA’s Summer of Soul. 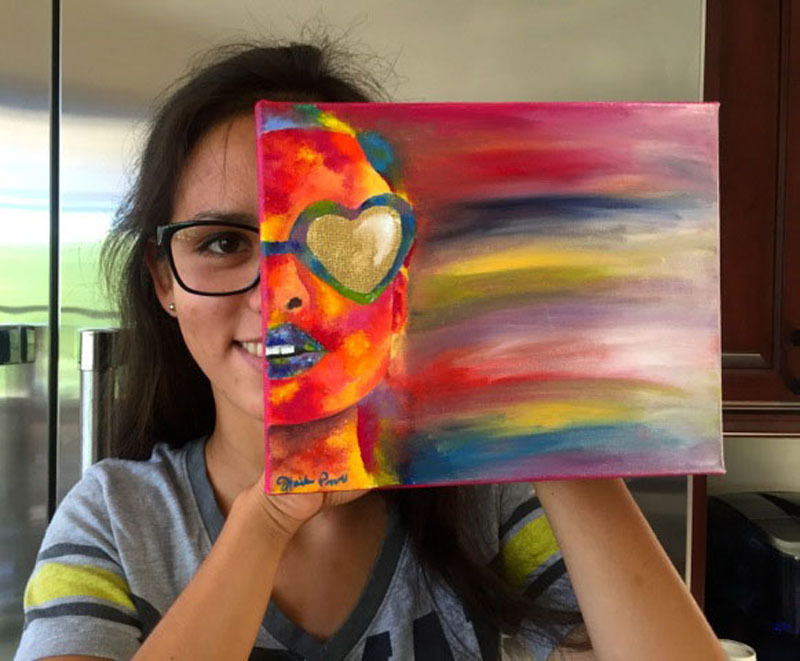 The art event will showcase 100 local artists’ sunglass themed creations. Each canvas will be available for a $99 donation. 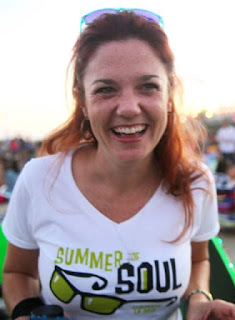 Donations will be split between Resonate LA’s Art Outreach and Compassion International. First come, first serve! The Upper West’s patio doors will open at 4pm sharp. Art will be flying off the wall. Come hungry to enjoy The Upper West’s delicious beverages and cuisine. Thirty-percent of all food and beverage purchases on August 30th will be generously donated by the Upper West! Seventeen year old, Hailee Powell has been Rich’s art student for nearly a decade. "When my lovely art teacher Bobbie Rich told me about this event, I knew I wanted to create something colorful and unique. 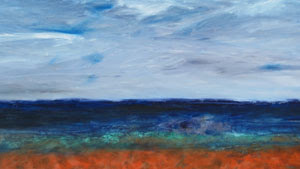 I will have two paintings on display in the Summer of Soul Exhibition. They compliment each other. The first one is of a girl with heart shaped sunglasses. The larger areas of her face are filled with warm colors, because I believe females are associated with warm colors. 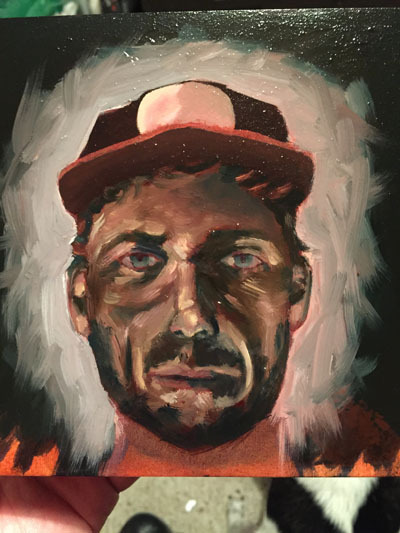 I will also be donating a male version of this painting where the cool colors will occupy the larger parts of the face, because cool colors are associated with males." Resonate LA is a community of Calling, Cause and Creativity. Resonate LA engages in Creative ministry because members believe that creativity is a foundational aspect of God’s personality, and because creativity generates spiritual exploration. Compassion International exists as an advocate for children, to release them from economic, social and physical poverty and enable them to become responsible and fulfilled adults. Saturday, August 22, 2015 Gabba Gallery Presents "Wood Metal Screw"
The Gabba Gallery presents the 2nd “Wood Metal Screw” exhibition on Saturday, August 22, 2015. The artists involved, some new to The Gabba Gallery and some veterans are all special for what they do. Creating a show around art created on any medium except for canvas is easy for some and harder for others, but these artists perfected it. From Christopher James, reclaimed metal sculpturist, artist Shane Blake, amazing street installer, his metal sculpture designs have been adorning places all over the west coast. 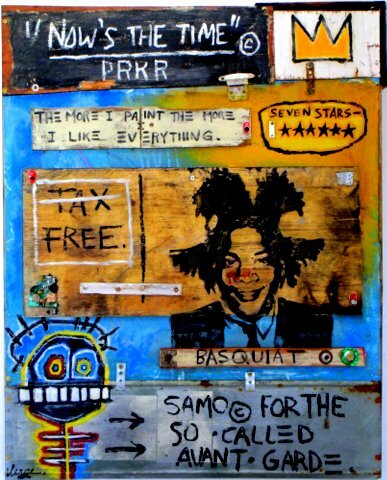 Artist Toshee and his incredible mixed media designs. 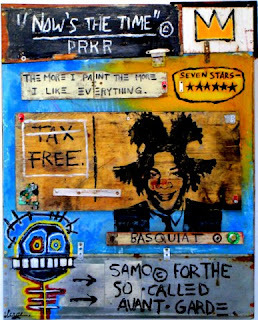 To artist Jennifer Verge, reclaimed wood and mixed media designer. Verge has been drawn to working on wood for the past six years. Incorporating found objects, the artist adds positive phrases to compliment her work. “it’s more about ideas, keeping your inspiration and imagination alive, trying to figure out what you have to say in a new and innovative way.” Verge first comes up with a concept, which determines the size. 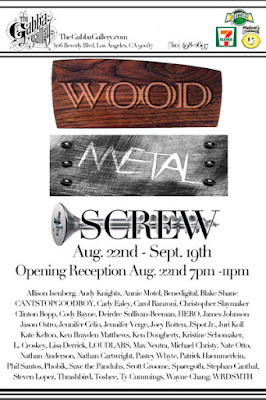 “Texture also plays an important role with the found objects, metal, wood,” said Verge. 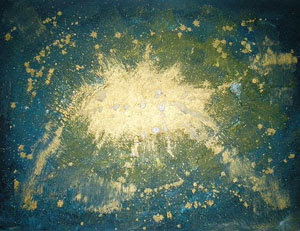 “I will start playing around piecing it all together.” The artwork is then created. 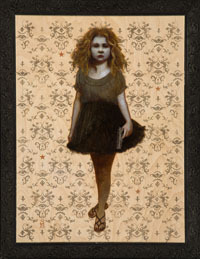 Deirdre Sullivan-Beeman is a self-taught figurative painter who uses modified oil and egg tempera techniques of the 14th Century Old Masters to create her magical-realism works. Co-curator Phil Santos said he was looking forward to the opening. “We have street artists that have painted murals in the Gabba Arts District, like Phobik and Clinton Bopp . We have seasoned fine artists/curators like Juri Koll and Nathan Cartwright. 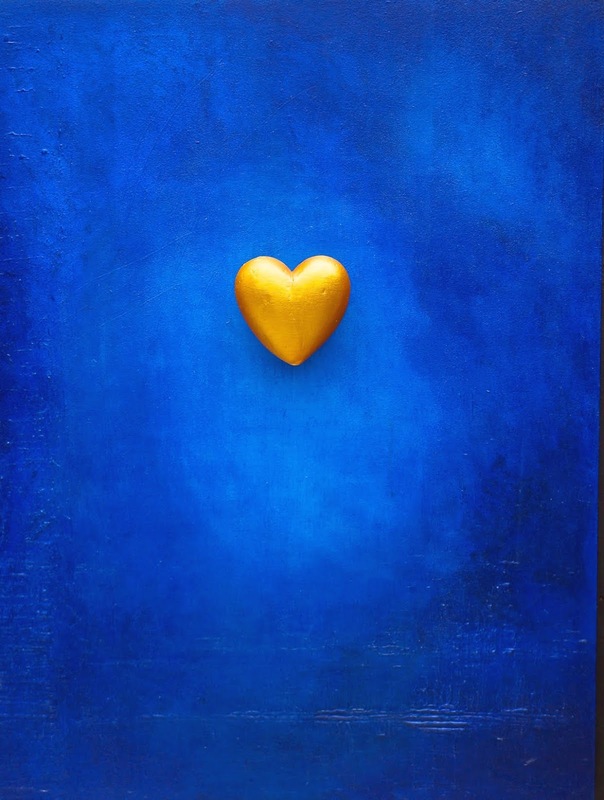 We have several incredible newcomers to The Gabba Gallery like Deirdre Sullivan-Beeman, and Jennifer Celio…and over 40 more talented artists. Artists include: Christopher Slaymaker, Nate Otto, Phobik, Cody Bayne, Max Neutra, HERO, Toshee, Clinton Bopp, Allison Isenberg, Spacegoth, Jennifer Verge, Pastey Whyte, Steven Lopez, Lisa Derrick, Peter Goode, Nathan Cartwright, Juri Koll, Jennifer Celio, L. Croskey, Joey Rotten, James Johnson, Deirdre Sullivan-Beeman, Ken Brayden Matthews, Carly Ealey, Ken Dougherty, Michael Christy, Phobik, JSpot Jr., Blake Shane, Scott Groome, Save the Panduhs, Kophns, and many more.